Note: This book is not by JJ Virgin. This cookbook was authored by Rebecca Lorraine, one of her successful students and is based on recommendations in The Virgin Diet book. If you are looking for the cookbook by JJ Virgin, it can be pre ordered and will be available 2/18/2014. 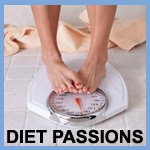 I first discovered The Virgin Diet when I stumbled across the author talking about her book on PBS. It didn’t take long to get the feeling she was talking directly to me as she pointed out how so many people are frustrated with their unsuccessful weight loss attempts. We do all the “right” things, live on low-fat, low-carb foods, deprive ourselves of desserts and exercise regularly . . . All without positive results. I was so happy to hear that there may be hope for me; I had to give it a try. If you’ve read The Virgin Diet by JJ Virgin, then you already know that many of the supposedly “healthy” foods in our diets may actually be making (or keeping) us fat, especially if our system is intolerant, and doesn’t know how to process them. There are 7 “high-FI” foods (the seven that people are most commonly intolerant of) that you completely eliminate for 21 days. Then, over the next 28 days, you reintroduce 4 of the 7 one by one (Soy, Gluten, Eggs and Dairy) to determine whether or not your system is OK with the given food, or if you should eliminate that food all together. The other 3 “high-FI” foods (Sugar, Corn and Peanuts) should, as a rule, be avoided 95% of the time for a number of reasons related to overall health and well-being. Now, if you are like me, the first thought is wow, what can I eat? It seems like you are cutting out everything that makes our meals taste good. Believe me, I’ve spent enough time on “diets” thinking all I should eat is bland baked chicken, vegetables, apples and rice cakes. But despite that initial thought, I was eager to go thru the process to determine what foods may be sabotaging MY weight loss attempts. As I went thru the initial 21-day process, I experienced exactly what the author highlighted in the show I watched. She pointed out the health benefits of eliminating the high-FI foods altogether, and how many people choose to do so after going thru the cycles. I really felt better, I had more energy, I noticed an improvement in my skin AND I lost 10 pounds! I basically decided I wanted to make a lifestyle change based on my results. Eating this way was easy, I felt good and it seemed like a great way to help me lose the additional weight I wanted to lose. Since so many of my standard “go-to” recipes and food choices include at least one of the 7, it was time to change my mindset, and focus on what I can eat, and not the foods being eliminated. I looked at some of my favorite recipes and figured out ways to modify them, eliminating the high-FI foods, using “cool substitutions,” and creating some more of my own. What I discovered is there are so many ways to make the good “healthy” food taste better, using fresh herbs and spices and fun combinations. I don’t even miss the ingredients I used to think were “must haves” to make my meals tasty. I put this collection of recipes together to share with anybody out there who may be having a difficult time making the “good” food taste great, without the high-FI foods. These recipes are Gluten-Free, Dairy-Free, Soy-Free, Egg-Free, Corn-Free, Peanut-Free and Sugar-Free. I left in a few including dairy and a few including soy for those who are tolerant, or for re-introduction weeks (and they are noted). My biggest challenge was the dinner-time dilemma, so I focused mostly on delicious Main Dishes and Sides. I hope you find these recipes helpful in your journey whether your goal is to feel better, lose weight, or just live a healthier lifestyle.